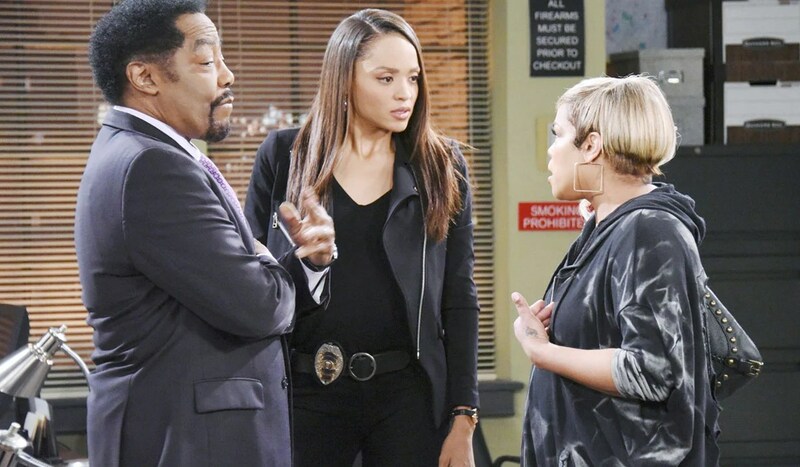 Wednesday October 24, 2018: Abigail lunges at Kate, Julie does Eli a favor, and tensions rise between Abe and Sheila. Julie’s excited to see Eli at Doug’s Place. He asks for a favor. Can she give Sheila a job? He confirms Sheila is only a friend but Julie fumes about his past with Gabi. She’d hoped there was more to his relationship with Sheila. Julie quizzes Eli on Shelia’s references and learns she was in prison. “Not another jailbird,” Julie sighs, as Eli fills her in on his past with Sheila and her brother. He died in prison and Eli wants to give Sheila a second chance. Julie’s proud of him and beams, “Saving the world one ex-con at a time.” She agrees to give Sheila a chance. Eli hugs his grandmother. In the office at Salem PD, Lani thinks back to Eli interacting with Sheila. Abe walks in and rants about Eli taking his parking spot. Sheila appears and admits she took it. She borrowed Eli’s car and knows Abe would never have his car towed, but Abe threatens, due to her disrespect, to do just that. Sheila pleads for Abe not to and Lani interjects her agreement. It would cost Eli a small fortune. Sheila’s sick of how people look down at her, but Abe orders her to move Eli’s car – or else. After Abe leaves, Sheila apologizes to Lani for their past issues. Lani accepts but suggests Sheila stop pushing Abe’s buttons. Lani brings up how Sheila is staying at Eli’s. Sheila ‘could be bumping into worse’ in his small apartment but plans to get a place of her own soon. Lani goes to find Abe in the interrogation room and pleads Sheila’s case. She’s had a rough life. Eli arrives back in the office and lashes out at Sheila for parking in Abe’s spot. When he brings up a job at Julie’s nightclub, Sheila’s excited – she’s always wanted to be a singer! Eli corrects her, Sheila will be hired as a dishwasher. Lani and Abe join them. Sheila’s stunned to hear Abe offer her the executive assistant job. Sheila ponders how it would be to work for Julie as a dishwasher and accepts. At the hospital, Abigail accuses Kate of teaming up with Gabi. Kate insists Gabi would never drug her and thinks Abigail’s D.I.D. is back. She saw Gabby. Jenn rushes to her daughter’s side and tries to calm her as Chad takes it all in. Abigail doesn’t relent, reminds Kate how she wanted Gabi with Chad and wonders if this is revenge for her killing Andre. She orders Kate to reveal what made Gabi convince her to lie. Kate sticks to her story, which causes Abigail to lunge at her. Jenn pulls her back but neither she nor Chad is able to stop Abigail from rushing off to get answers. Kate apologizes to Chad as he waits for the elevator. Once he leaves, Jenn apologizes to Kate for Abigail’s outburst. Kate thinks Jenn would benefit to get Abigail the help she needs. 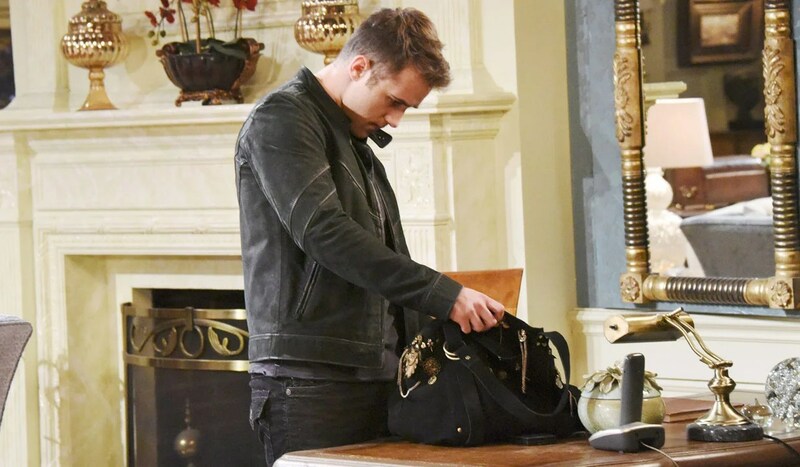 JJ searches Gabi’s purse at the Kiriakis mansion, looking for proof Gabi set Abigail up. Gabi catches him. He hands over the purse and brings up Abigail. Gabi’s offended that JJ would think she’d set up her best friend. JJ apologizes but he doesn’t know what to believe. Gabi claims to love Abigail and wants her to get the help she needs. “Stop pretending that you give a damn about me,” Abigail says from behind them. She checks off all of the things that have happened and wonders how Gabi managed to act them out. Abigail rants about how Kate’s always been there for her, like when she threw Nick into the river. Though Gabi refuses to admit anything, would Abigail blame her if she did do all of it? She destroyed her life! Gabi urges Abigail to get help. Abigail’s stunned when JJ appears to side with Gabi and insists they go back to the hospital. Abigail refuses and demands to take her son. Gabi won’t allow it. Chad appears and agrees with Gabi. JJ goes with Abigail to say goodnight to Thomas. When Abigail returns, unseen, she overhears Chad telling Jenn, on the phone, that he’s going to have her committed. Abigail sneaks off. Chad agrees to meet Jenn and Kayla at the hospital. When JJ reappears, everyone wonders where Abigail went. Stefan stirs awake on the couch at the DiMera mansion. He sees Gabby and calls out to her. Gabby joins him. Stefan’s missed her and promises he won’t let Abigail keep her buried. Gabby calls him ‘Sam’, puts Stefan’s hand on her belly and reminds they made a baby. She needs him to get to work so they can be together. His love gives her life while trapped in Abigail’s mind. Has he given up on her? Stefan never would and takes Gabby in a passionate kiss. Gabby brings up his drinking and continues to accuse him of abandoning her and their child. He vows never to lose Gabby and kisses her again. As they fall to the couch, Stefan wakes up to an empty room. Suddenly, Abigail storms in and desperately asks Stefan for help. John goes to Roman in an attempt to deal with Hattie once and for all.